In a series of lectures delivered to the Air War College in the years after World War II, Dr. James T. Lowe, the Director of Research for the Strategic Vulnerability Branch of the U.S. Army’s Air Intelligence Division, described the elements of “The Bombing Encyclopedia of the World.” The Bombing Encyclopedia, he said, was “a huge index of basic, factual information that is being built up on all potential objectives of air attack throughout the world” (Lowe 1948:6). Lowe explained how it was being constructed. First, potential bombing targets were plotted on map inserts, and each target was assigned a number. 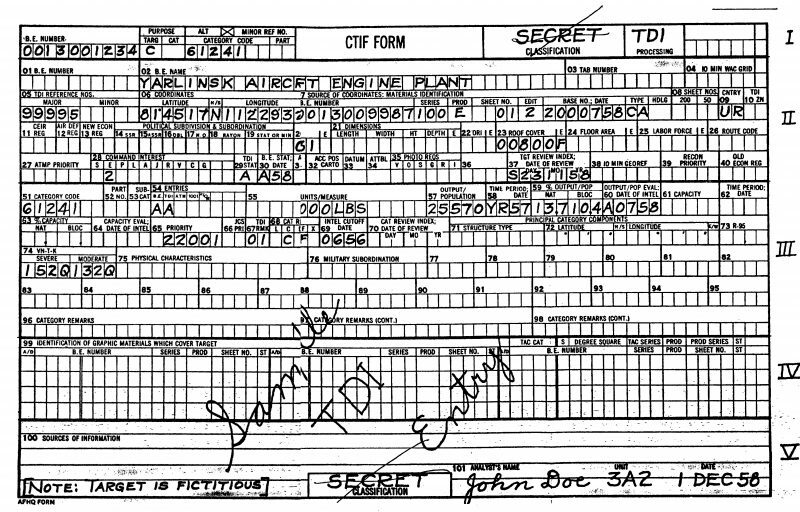 Then, information on each target—“all necessary detailed facts that will be needed later to make a target analysis”—was punched into an IBM card using a coding system. “The combination of the maps and the codes,” Lowe summarized, “is what constitutes the Bombing Encyclopedia” (1946:13). Using it, an analyst could make a punch card “run” on a tabulating machine (see Figure 1) that would identify potential targets based on a range of selected criteria. Figure 1. 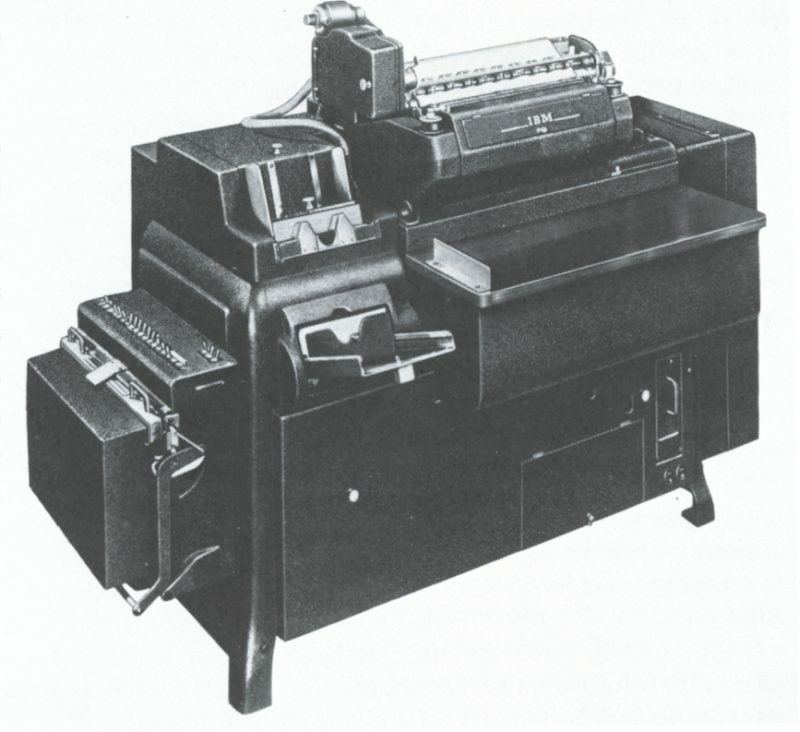 The IBM 405 Electric Punched Card Accounting Machine, a model in operation in the years immediately following World War II. In a typical application, the machine read a deck of punched cards, each of which contained a series of numeric fields. The machine then tabulated the totals for each of the selected numeric fields. The Bombing Encyclopedia was a remarkable effort to organize a massive amount of information that could be rapidly queried to identify air targets in the event of a future war. What is perhaps surprising is the nature of the bombing targets it identified, and thus of the data being assembled. These targets were not just military installations, but an array of industrial plants, service facilities, and other vital structures of the industrial economies of the world. And the information collected in the Encyclopedia did not only relate to the immediate military relevance of a particular facility, but also to the complex web of economic interconnections into which it was embedded: the number of employees, the volume of its total production, the raw material inputs it used, and the finished products it produced (see Figure 2). Figure 2. Sample of the “Consolidated Target Intelligence Form” created to help manage the information contained in the Bombing Encyclopedia. For each bombing target, a form was filled out that included: (1) codes for machine processing; (2) information identifying and locating the target; (3) information on the category of the target and its individual characteristics; (4) references to graphic coverage on the target; and (5) sources. The Bombing Encyclopedia’s emphasis on industrial targets followed from the type of war envisioned at the time by military strategists, a “total war” fought not only by military forces, but by entire military-industrial economies and populations. As Lowe declared, “War in its final analysis is nothing more nor less than a contest of national energies” (1948:15). In a memo on air war planning written early in World War II, industrial economist Emile Despres argued that the contest must be understood as “a deadly race to bring American resources up to capacity while simultaneously reducing those in Germany” (Katz 1989:104). In the same fashion, a future war would be won by simultaneously mobilizing one’s own military-industrial production system and “de-mobilizing” that of the enemy. Preparedness for an air assault to achieve this aim in a future war was the defining mission of the Strategic Vulnerability Branch (SVB). As Lowe put it, SVB sought to “determine the strategic vulnerability to attack of all the countries of the world including the United States and to recommend targets for destruction in the event of war” (1946:2). The task for strategic vulnerability analysts was to find the key target system—whether electricity, petroleum, transportation, airframe production, or some other system—“the destruction of which would cut across the totality, the entirety of the enemy’s ability to defend himself” (1946:7). Figure 3. 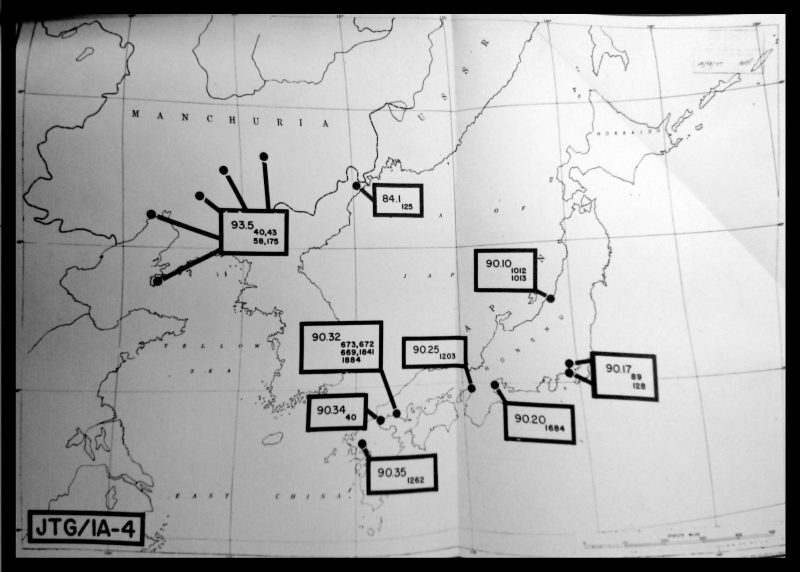 In the latter stages of World War II, the Joint Target Group produced maps and target lists based on their analyses of critical vulnerabilities in the Japanese military-industrial economy. This target map focuses on Japanese oil production facilities as a potential target system. It is notable that some of the targets identified on the map are located in Japanese-occupied parts of China. Though this target system was vital to the Japanese military-industrial production apparatus, it extended beyond Japanese territory. 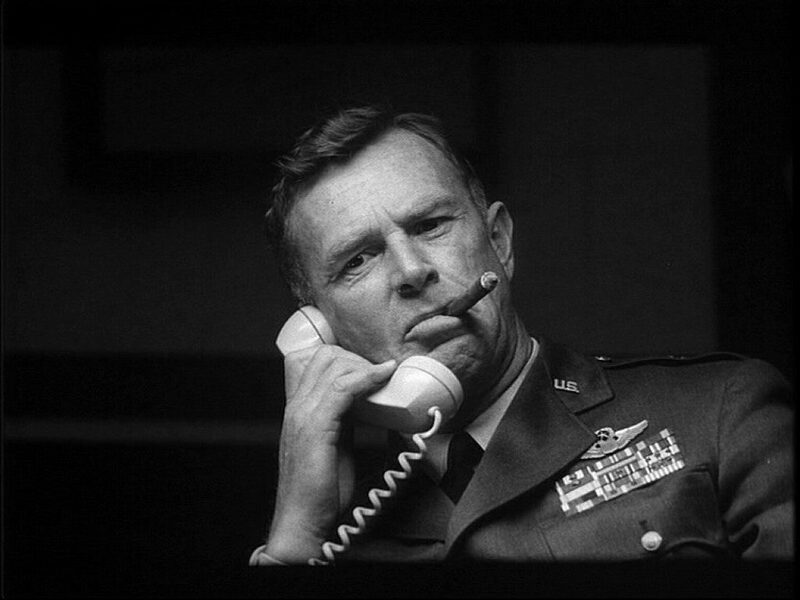 During the war, Lowe served as an air intelligence specialist in the Joint Target Group (JTG), where many of the techniques used in the Bombing Encyclopedia were first developed. 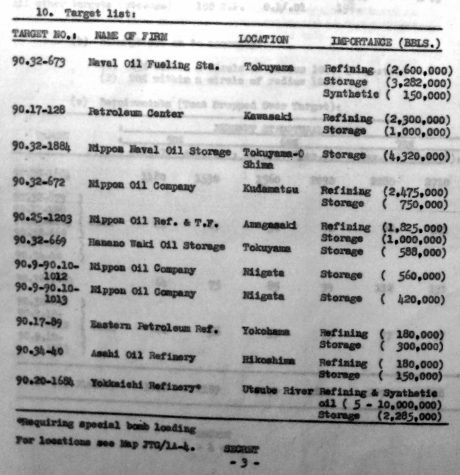 JTG specialists compiled information on potential targets in the Japanese war economy, including the type of installation, its location, and its significance in a given target system. JTG target reports then compared potential target systems and made recommendations on optimal attack strategies. The combination of maps and codes contained in the JTG target reports (see Figures 3 and 4) was the precursor to the information contained in the Bombing Encyclopedia. Figure 4. Target list from Joint Target Group Japan Report (December 1944). The target numbers correspond to some of those on the target map in Figure 3 (JTG/1A-4). After the war, military planners asked what lessons the air war in Europe and Japan held for U.S. air strategy in the future. They pointed in particular to the lack of air intelligence early in the war, which made it difficult to determine productive air targets. “If a comparable lack of intelligence should exist at the outset of a future national emergency,” argued the US Strategic Bombing Survey, it might prove disastrous” (USSBS 1946:108). Or, as Lowe put it, a future war would “begin with an attempted Pearl Harbor on the industrial heart land of the United States” (1946:12). Strategic planners sought to ensure that American air forces would be prepared in advance for such an eventuality. In this context, the SVB’s mission was “to make a pre-analysis” of the vulnerability of potential adversaries around the world, and to “carry that analysis to the point where the right bombs could be put on the right targets concomitant with the decision to wage war without any intervening time period whatsoever” (Lowe 1948:4). Thus, peacetime preparedness entailed maintaining a continually updated inventory of information on the world’s military-industrial economics. Recalling the experience of the JTG during World War II, Lowe noted that information about the Japanese industrial economy had not been hidden or secret. Rather, it was “open intelligence—facts about industry, location of plants, machinery that is in them, the materials that go into the plants, who uses the output, etc.” (1946:12). But this information was “scattered everywhere—in military and government files, and in the files of banks, insurance companies, engineering offices, and religious organizations.” Similarly, in the early Cold War the problem for intelligence analysts was not how to access hidden data, but rather “how to cope with a perfect avalanche of information.” The solution, according to Lowe, depended both on having people “with sufficient professional ‘know how’ to handle the data when it has been attained,” and on the “integrity of the plan of operations to handle this great mass of data” (1946:12-13). The analysts in the SVB would provide the relevant “know how.” And the construction of the Bombing Encyclopedia was SVB’s plan for handling the “mass of data” necessary for target selection. Lowe argued that the punch card tabulation system used for the Bombing Encyclopedia would make it possible to organize and access this massive amount of data with greater efficiency, accuracy, and flexibility. The new “machine methods” of information management made it possible “to operate with a small fraction of the number of people in the target business that would normally be required.” The “disadvantages of human errors and human filing systems” could be almost entirely eliminated. And the data could be flexibly accessed: it would not be organized through a single, rigid system of classification, but could be queried through “runs” that would generate reports about potential target systems based on selected criteria such as industry and location. As Lowe explained, “[b]y punching these cards you can get a run of all fighter aircraft plants” near New York or Moscow. “Or you can punch the cards again and get a list of all the plants within a geographical area…. Pretty much any combination of industrial target information that is required can be obtained—and can be obtained without error” (Lowe 1946:13-14). The speed and flexibility of the Bombing Encyclopedia, according to Lowe, made it possible to address a new problem: the need to prepare in advance for a range of possible future contingencies, rather than for a single predetermined objective (as had been the case in World War II). Using the Bombing Encyclopedia, he explained, one could screen the 70,000 potential objectives a given country offered through a “fine mesh” to get to “the 70 odd or 7 that are within the capabilities of the attacking air force” and whose destruction “would make the maximum contribution to the attainment of the mission” (1946:7). To illustrate, Lowe noted that a punch card run would enable the analyst to “choose between the electric power plants in a given country and the aluminum plants, the transportation system as against the steel industry, or the aircraft industry as against small arms and ammunition” (1948:13). Once such objectives had been selected, SVB could recommend specific target systems to the Strategic Air Command, which would in turn “prepare the operational target charts [to be] ready for any national emergency” (Lowe 1946:3). During the 1950s, vulnerability analysts continued to add information on new targets to the Bombing Encyclopedia; by 1959 it included more than 78,000 target listings (Clinard 1959:89). Meanwhile, increasingly sophisticated technologies for data handling were developed: magnetic tapes replaced punch cards; digital computers replaced tabulators. Although the name changed (today it is known as the Basic Encyclopedia) and support for the program ebbed and flowed at different moments, the U.S. Air Force has continued to maintain something very much like the Bombing Encyclopedia up to the present day (Gregory 2012). But the broader significance of the Bombing Encyclopedia should be sought elsewhere. In developing it, strategic vulnerability analysts formalized a distinctive and novel set of techniques for organizing and analyzing large amounts of data about economic and social life, and for relating the present to an uncertain future. These techniques would have far-ranging uses beyond the specific domain of strategic target selection. In The Taming of Chance, Ian Hacking (1990) showed how, in the first decades of the nineteenth century, an “avalanche of numbers” enabled a new understanding of collective existence. By recording and assembling increasingly comprehensive information about phenomena such as crime, illness, and poverty, it became possible to project the regular occurrence and distribution of past events into the future, based on the assumption that these statistical regularities would remain constant over time. A new object of knowledge and a new target of government intervention were thereby constituted: a society governed by statistical laws (Hacking 1990:46). Much like the administrative science of statistics, the Bombing Encyclopedia was built to manage what Lowe called a “perfect avalanche of information,” but it was meant to contribute to a different kind of knowledge about collective existence, and to establish a very different relationship between the present and the future. The inventory assembled for the Encyclopedia was not a record of the past; rather, it was a catalog of the elements comprising a modern military-industrial economy. The analysis of strategic vulnerability did not calculate the regular occurrence of events and project the series of past events into the future, based on the assumption that the future would resemble the past. Rather, it examined interdependencies among these elements to generate a picture of vital material flows and it anticipated critical economic vulnerabilities by modeling the effects of a range of possible future contingencies. It generated a new kind of knowledge about collective existence as a collection of vital systems vulnerable to catastrophic disruption (Collier and Lakoff 2015). A key moment in the translation of this type of knowledge from air targeting to other domains was the adoption of the techniques used in the Bombing Encyclopedia for use in the field of non-military defense planning. This field was concerned not with planning attacks on enemy production systems, but with identifying and reducing sites of domestic vulnerability. In the 1950s, several vulnerability analysts who had served in the SVB were transferred to the Office of Defense Mobilization, the Executive Branch office responsible for non-military defense. There they were charged with developing damage assessment techniques that could anticipate the effects of an enemy attack on the American military-industrial economy. Using the new Univac computer (see Figure 5), and drawing on enormous amounts of information about industrial production, government and military facilities, and critical infrastructures, they designed increasingly sophisticated models of the effects of a projected nuclear attack on the United States. Given the concerns of non-military defense—which included the survival of the civilian population in the aftermath of an attack—the range of critical systems considered in such models was expanded beyond military-industrial production systems to encompass health infrastructures, food systems, and public utilities that met civilian needs. Over the following decades, these tools for modeling uncertain future events—the inventory of elements at risk, interdependency analysis to determine vulnerability, and computer-based simulations—were applied to a range of other kinds of potential catastrophes, from natural disasters, to pandemic outbreaks, to financial crises. By the beginning of the twenty-first century, such tools were understood as the key components of a generic technique for anticipating future events: catastrophe modeling (Collier 2008). Underlying catastrophe modeling as it is applied today in many domains are practices for assembling data about economic and social life that are very similar to those used in the Bombing Encyclopedia. Systemic risks in finance are made visible through inventories of financial institutions, with their interlocking liabilities. Portfolio risks in insurance are grasped through inventories of insured properties, models of future disasters, and assessments of insurance companies’ exposures. Vulnerabilities to pandemic outbreaks are understood through inventories of medical stockpiles, emergency care facilities, and medical personnel, whose interdependency is put to the test through complex models. Thus, techniques for accumulating and assessing large amounts of data initially developed in wartime air targeting continue to carve out new objects of knowledge and of governmental concern. Figure 5. 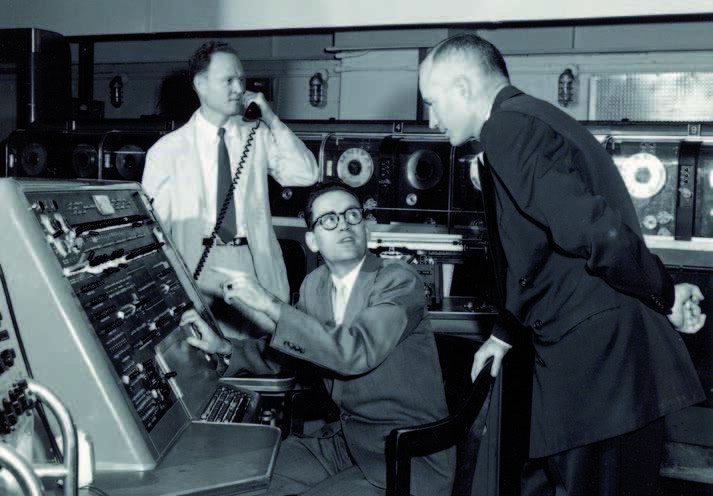 Mathematician Burke Horton (right, standing) was a key figure in bringing the techniques developed in the Strategic Vulnerability Branch into the world of nuclear preparedness during the mid-1950s while working in the Office of Defense Mobilization. The very first Univac computers were built for military and government use in 1952: the first went to the Census Bureau, and the second went to the Air Force Management Directorate. Horton is examining the latter in this photograph. These computers initially used punch cards similar to those used in the tabulation machines described above, and then switched to magnetic tape for data storage. Clinard, Outten J. 1959. “Developments in Air Targeting: Data Handling Techniques.” Studies in Intelligence 3:95–104. Collier, Stephen J. 2008. “Enacting Catastrophe: Preparedness, Insurance, Budgetary Rationalization.” Economy and Society 37(2):224–250. Collier, Stephen J., and Lakoff, Andrew. 2015. “Vital Systems Security: Reflexive Biopolitics and the Government of Emergency.” Theory, Culture, and Society 32(2):19–51. Eden, Lynn. 2004. Whole World on Fire: Organizations, Knowledge, and Nuclear Weapons Devastation. Ithaca, NY: Cornell University Press. Gregory, Derek. 2012. “Bombing Encyclopedia of the World.” Geographical Imaginations, August 3. Available at link. Hacking, Ian. 1990. The Taming of Chance. Cambridge, UK: Cambridge University Press. Joint Target Group. 1944. JTG Estimate No. 1, Strategic Air Employment Suitable to the Current Strategy of the Japanese War, December 1944. NARA RG18.UD21. Available at link. Katz, Barry M. 1989. Foreign Intelligence: Research and Analysis in the Office of Strategic Services. Cambridge, MA: Harvard University Press. Lowe, James T. 1946. “Intelligence in the Selection of Strategic Target Systems.” lecture, Air War College, Maxwell Air Force Base, Alabama. Documents M-U 38043 L913i. Muir S. Fairchild Research Information Center, Air University. ———. 1948. “The Theory of Strategic Vulnerability,” lecture, Air War College, Maxwell Air Force Base, Alabama. File K239.716250-43, Air Force Historical Research Agency, U.S. Air Force.